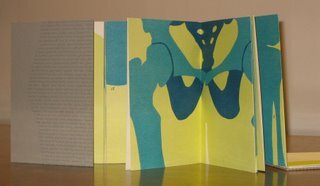 Students, graduates and faculty from the University of Alabama Book Arts Masters Program will present their work at an exhibition in Central's Fourth Floor Gallery at the Birmingham Public Library January 3-February 12. The exhibition will highlight the three labor-intensive stages of the bookmaking process—papermaking, printing, and book binding—with work by artists from the region who are affiliated with the University of Alabama’s graduate program. The painstakingly crafted paper, prints, and books on display at the Birmingham Public Library will demonstrate a remarkable craft that—in a world of mass-produced white paper, speedy laser printers, and efficient printing presses—most of us are unaccustomed to seeing. Book artists begin papermaking by using a variety of natural fabrics and fibers: a second-hand linen dress found at a thrift store, bark from a tree native to Alabama, or an old pair of denim blue jeans. Flecks of color, unexpected textures, and imperfections around the edges make each piece a unique medium for language and art. The fineness of the paper is enhanced when the artist carefully chooses words that are imprinted onto each homemade sheet with a printing press; the force of metal or wood type depresses ink into porous fiber. Many of the pieces in this exhibition feature the artists’ own writing or that of a cooperating author. Artists choose a typeface—better known as a font—to complement the subject matter, mood, and color of the piece and often include etched images to serve as a background or central illustration. Finally, each single work is bound together to make a new work—a book—that is both practical and aesthetically exquisite. Bindings range from simple to remarkably intricate and demonstrate a variety of ancient and modern stitching techniques from around the world. Covers are made from paper, cloth, and leather and complement the work to be found inside. This University of Alabama program teaches papermaking, printing, and book binding using historical techniques, emphasizing the art and craft of making books by hand with traditional materials and equipment. The works in this exhibition illustrate that traditional book artists draw on many creative abilities—writing, etching, sewing—to transform something as practical as a book into an elegant work of art. Many books about Gerald R. Ford are available for check out at your local library. 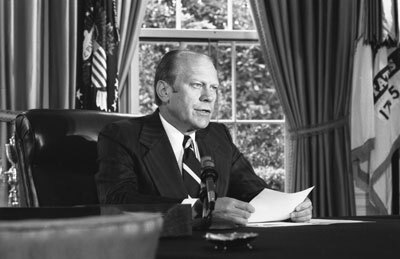 A President's Legacy National Public Radio's (NPR) collection of audio news and related material about Ford's presidency and funeral. Are you searching for the history of Kwanzaa, special recipes for New Year's Day, or holiday crafts? Let BPL's Kwanzaa and New Year's Day subject guides give you a helping hand. 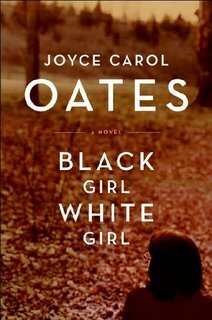 Joyce Carol Oates' novel Black Girl / White Girl "is a searing double portrait of 'black' and 'white', of race and civil rights in post-Vietnam America". Book reviewer Arlene McKanic states "Joyce Carol Oates is masterful at depicting ugliness, and the list of what is ugly in her world seems endless: the smell of unwashed flesh with its grease and pimples, overflowing trash, ill-fitting clothes, dying canals gleaming with toxins, the indignity of the female body and its processes. Moreover, there's the ugliness of her characters' dark, unspeakable and sometimes murderous impulses. The Bryn Mawr-like campus in her latest novel, though pretty enough to an outsider, partakes of this general ugliness. As one might guess from the book's title, the perversity of American race relations is one of the themes of Black Girl / White Girl." Celebrating 30 years of service to the Birmingham community, the Birmingham Public Library’s Archives will embark on an ambitious project to make its extensive collection more accessible to teachers, students, researchers, and the general public. With a state-of-the-art overhead scanner—purchased with grants from the community—the Archives will scan Birmingham’s founding documents including the original survey for the city. The 133-year-old volume contains the original maps and field notes of the survey team that laid out Birmingham's streets in 1872. The Archives will also now be able to digitize atlases such as the Beers and Ellis Atlas of Birmingham—a rare 1887 atlas containing full color maps of downtown Birmingham; Baist's Property Atlas of Birmingham—a rare 1902 atlas of full-color maps of downtown Birmingham; and other historic maps and illustrations of early Birmingham. “With this type of overhead scanner, the Archives can safely scan materials that are too fragile or too cumbersome for a standard scanner,” said Head Archivist Jim Baggett. He anticipates that a high-quality scanner will allow the Archives to digitize many one of a kind historic documents and make them available on the Internet. The Archives will share the scanner with Oak Hill Cemetery, which holds an estimated 10,000 burials and associated interment records from the city’s founding to the present. The Cemetery, which is the burial place for many of the city’s founding families, will use the scanner to digitize interment records, providing the public with important information about Birmingham’s founders. According to Library Director Barbara Sirmans, “this equipment will enable the Library to push forward with several of our key goals. It will provide adequate and appropriate technology for users to access the information they need. It will also greatly accelerate our effort to offer outstanding online content drawn from the Library’s own special collections.” Using current technology for the benefit of patrons is crucial to the Archives. The number of files Archives staff retrieve for researchers has gone up more than 60 percent in the last six years, and placing fragile items online is imperative for original documents to remain in-tact for generations to come. 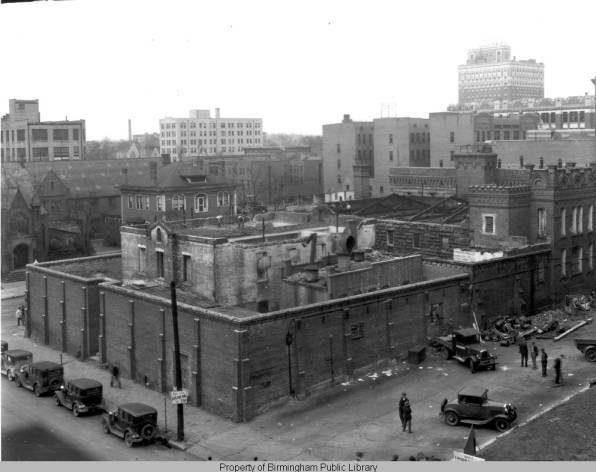 The Birmingham Public Library Archives holds over 30,000,000 documents and over 400,000 photographs on subjects ranging from local to international significance. 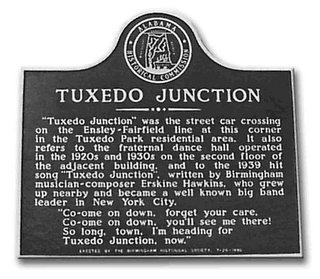 Subject areas of particular strength include local government, urban and economic development, industry and the labor movement, women's history, religious history, art, music, literature, sports, and the largest collection in existence relating to the Civil Rights Movement in Birmingham. The collection is open to the public and draws researchers from the U.S. and around the world. In 2005 the Archives served nearly 2,000 local, national, and international researchers with a record 95,000 files. In 2004, the work of one researcher won an Academy Award, adding to works researched in the Archives that have earned an Emmy, a Peabody, and three Pulitzer Prizes. The scanner purchase was made possible with very generous support from the Birmingham Public Library Foundation, Vulcan Materials Company, Glenn Ireland, William Ireland, Energen, David Herring and the Oak Hill Memorial Association, the Birmingham Historical Society and the Friends of the Birmingham Public Library. Birmingham Public Library and Jefferson County Library Cooperative are excited to announce our newest online resource, Rosetta Stone. Now any time of the day or night you can learn to speak, write and understand new languages using your natural language-learning abilities and fully-interactive technologies. Take a tour or start learning a new language. 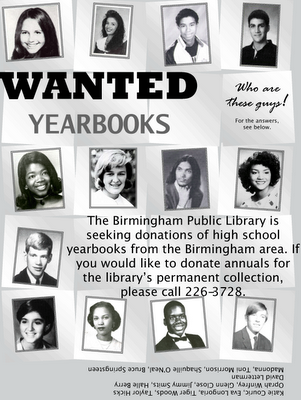 The Birmingham Public Library is seeking donations of high school yearbooks from the Birmingham area. If you would like to donate annuals for the library's permanent collection, please call (205) 226-3728 or fill out our online form. 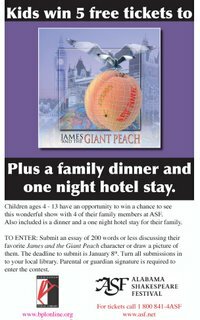 Kids win 5 free tickets to Alabama Shakespeare Festival's production of James and the Giant Peach plus a family dinner and one night hotel stay. Children ages 4-13 have an opportunity to win a chance to see this wonderful show with 4 of their family members. 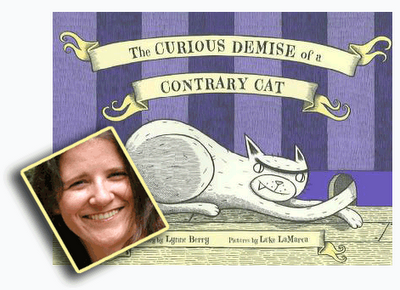 The Birmingham News recently published two articles about BPL's downloadable audiobooks and the Web site Teachers' Pet. Teachers' Pet provides links to original history documents and photographs for classroom use. 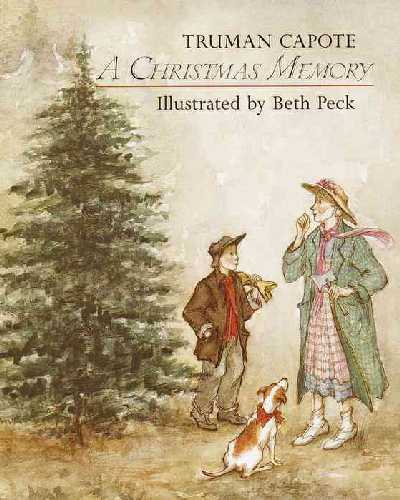 "Libraries offer books for download"
"Library site helps teach history"
Birmingham author Tim Hollis reminiscences about visiting Santa, the Enchanted Forest and the holidays of his childhood in Downtown Birmingham during this Wednesday's Brown Bag Lunch program. The program takes place in Central's Arrington Auditorium at noon. 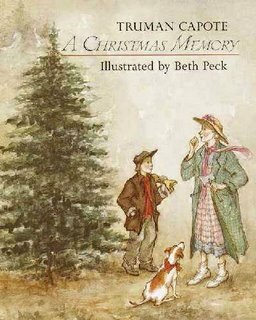 Visit Central library Dec. 13 at noon to hear Birmingham storyteller and actress Dolores Hydock present “A Christmas Memory”. The event will be held in the Arrington Auditorium. Come early to get a seat at this popular event. Bebe Moore Campbell, best-selling author of several books, journalist and NPR commentator, died November 27 of brain cancer complications. Celebrate her life by reading one of her books, listening to her commentaries, or reading more about her life and career. Join Birmingham storyteller Lee Smith this Wednesday, November 29 at noon in Central's Arrington Auditorium. She will share stories of love, laughter, loss and secrets that are never discussed at the Thanksgiving table. 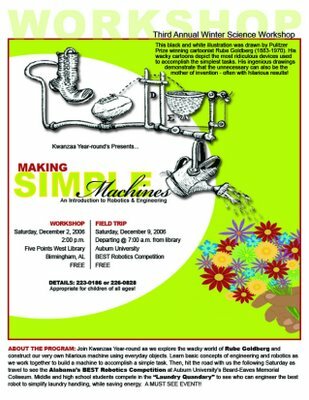 Join Kwanzaa Year-round at Five Points West Regional Branch as we explore the wacky world of Rube Goldberg and construct our very own hiliarious machine using everyday objects. Learn basic concepts of engineering and robotics as we work together to build a machine to accomplish a simple task. Then, hit the road with us the following Saturday as we travel to see Alabama's Best Robotics Competition at Auburn University. Over 30 local authors will have their books for sale December 1-2 at the downtown library. Come to Central's first floor from 10 a.m-3 p.m., buy a book or two, and have the authors autograph your purchases. 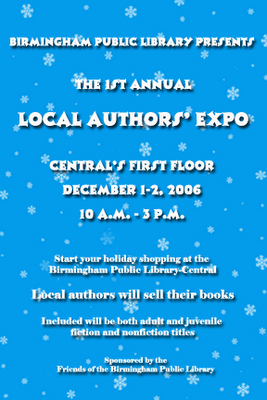 This expo is sponsored by the Friends of the Birmingham Public Library. 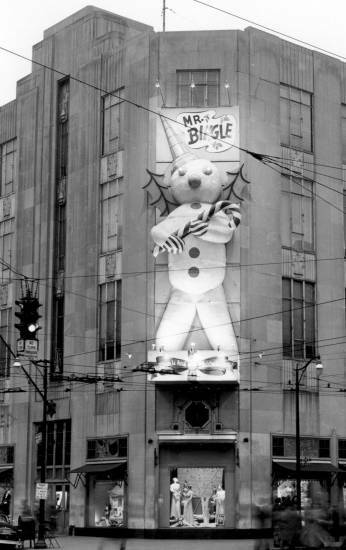 With BPL's Thanksgiving resources guide, you can read about the history of the holiday, discover a new recipe, or find a clever craft for your children to create. 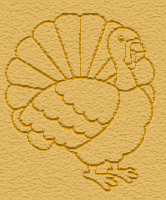 Check it out and Happy Thanksgiving from all of the staff at your Birmingham Public Library. 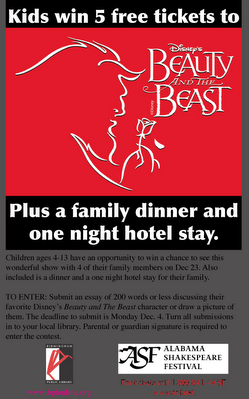 Kids win 5 free tickets to Alabama Shakespeare Festival's production of Disney's Beauty and the Beast plus a family dinner and one night hotel stay. Children ages 4-13 have an opportunity to win a chance to see this wonderful show with 4 of their family members on Dec. 23. To Enter: Submit an essay of 200 words or less discussing your favorite Disney's Beauty and the Beast character or draw a picture of them. The deadline to submit is Monday Dec. 4. Turn all submissions in to one of our branch libraries. 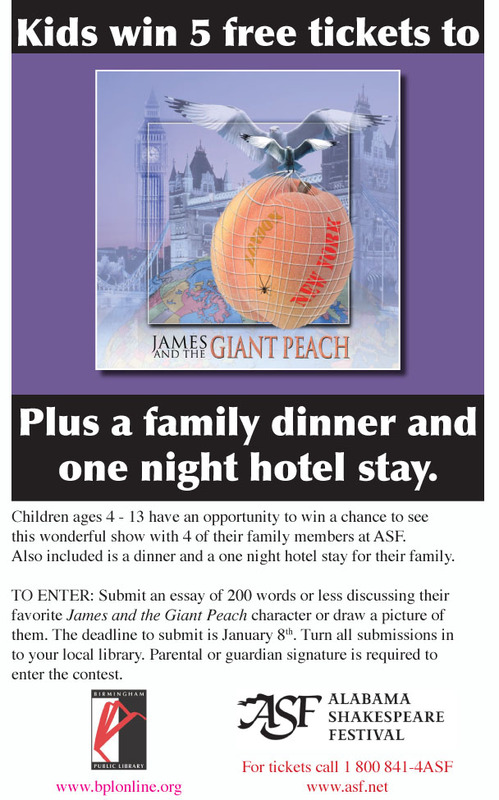 Parental or guardian signature is required to enter the contest. 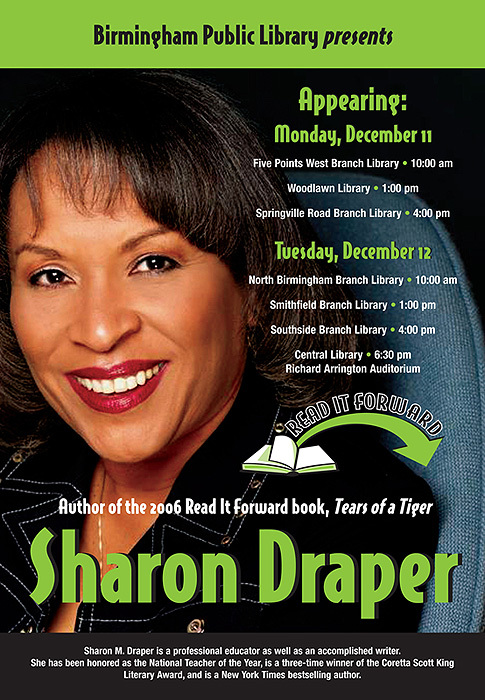 Sharon Draper, author of the Read It Forward book, Tears of a Tiger, will be visiting Birmingham Public Libraries and speaking about her book. 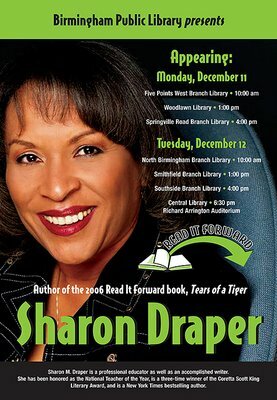 Five Points West Branch 10 a.m.
Springville Road Branch 4 p.m.
North Birmingham Branch 10 a.m.
Central -Arrington Auditorium 6:30 p.m. In celebration of Children's Book Week, John McCutcheon will perform at several branches. Please come and join in the fun. 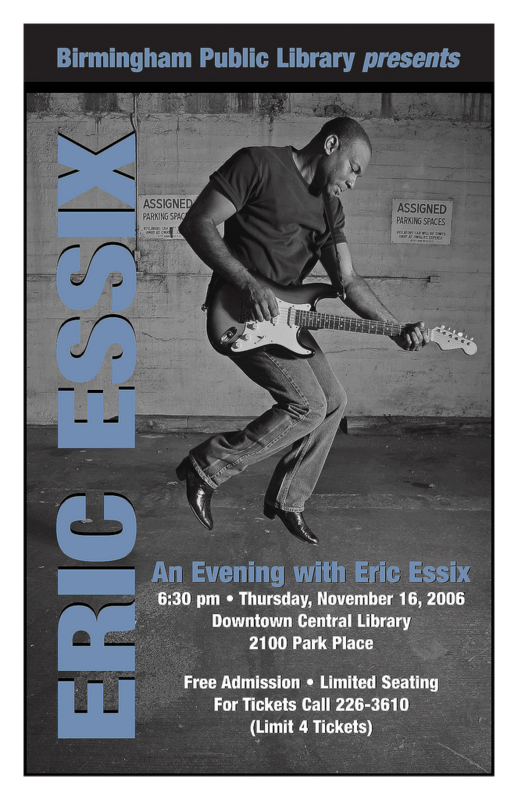 Come and spend an evening with Eric Essix at the Central Library on November 16th at 6:30 p.m. Admission is free but you must have a ticket. For tickets call (205) 226-3610. There is a limit of four tickets per person. 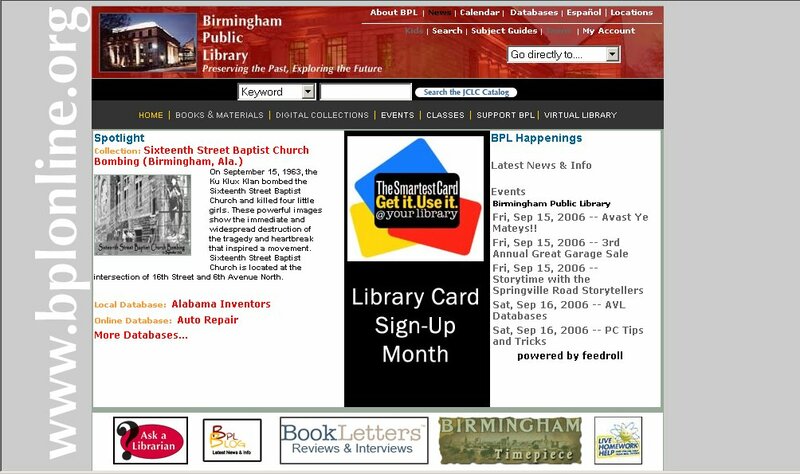 BPL's four regional branches Avondale, Five Points West, North Birmingham, and Springville Road now join Central to provide free wireless Internet access. 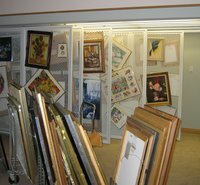 The Arts/Literature/Sports Department has many framed art prints that can be checked out. The prints cover a wide variety of subjects and periods. 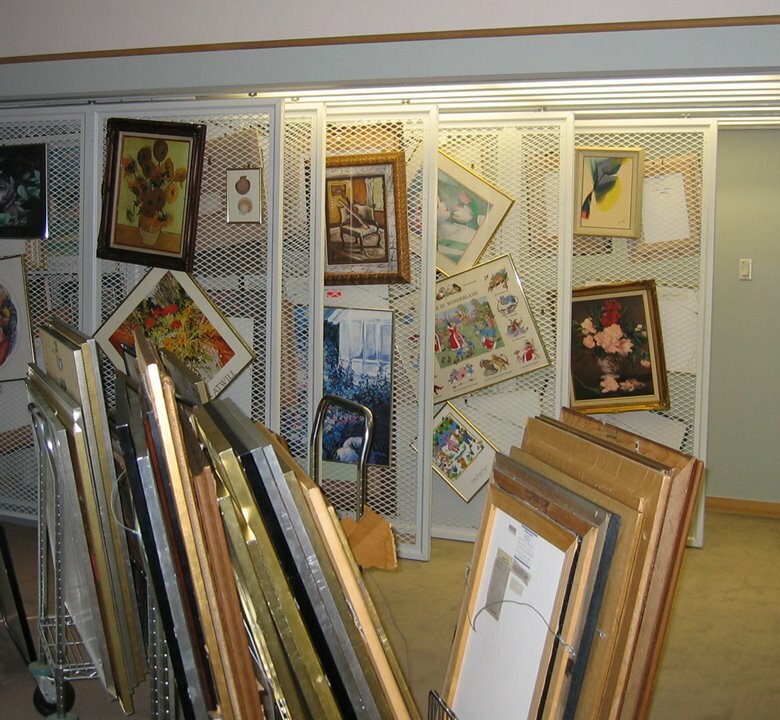 These include reproductions of works by well-known artists, a variety of landscapes, still lifes, portraits, and photographs, as well as some children's art. These art prints are a great way to enhance your home décor at no cost. The check out period is for 60 days and a maximum of two prints may be checked out per library card. 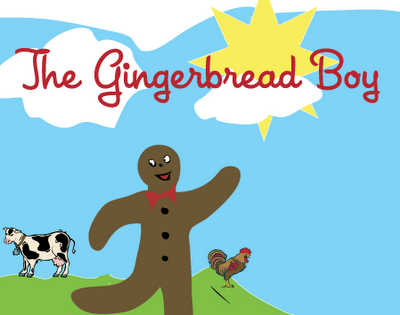 The Gingerbread Boy will be presented by the Birmingham Children's Theater tomorrow, September 28th at the Springville Road Regional Branch. The play begins at 4 p.m. Call June Lacanski (205) 226-4085 for additional information. Catcher in the Rye . . . Harry Potter . . . Captain Underpants . . .
Every year, there are hundreds of attempts to remove books from schools and libraries. 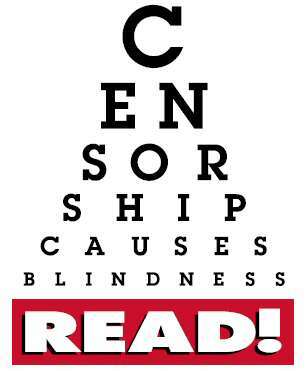 Celebrate YOUR freedom to read and right to choose your book during Banned Books Week, September 23rd to the 30th. Join the banned books virtual panel discussion this Monday at 9 a.m. with frequently banned authors, Chris Crutcher and Sonya Sones, and American Library Association Intellectual Freedom Expert, Kent Oliver. This is an ongoing project of the Government Documents Department and the years covered (as of 9/21/06) are December 1960 - December 1976. There are already almost 100,000 entries in the database. The Business, Science & Technology Department at Central subscribes to the property information database RealQuest. With this database you can locate current Jefferson County real estate information such as the names of property owners, street addresses, parcel numbers, sales and financing data, property descriptions, maps, taxes, etc. So, if you find yourself in need of such information, drop by the Central Library and we will be happy to assist you. 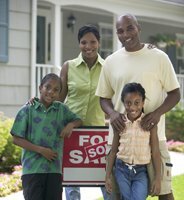 Is trying to buy a home getting you down? Attend West End's Credit Smart Workshop tomorrow (September 14) at 5:30 p.m. to learn how to improve your credit rating in preparation for home ownership. The workshop will be taught by Sarita J Womack, Director of Housing for the Birmingham Urban League. Snacks will be provided. Call Denise Allen at (205) 226-4089 for additional information. BPL is joining over 430 libraries worldwide as a part of the September Project. Central and Pratt City libraries will feature window displays remembering the events of September 11, 2001. 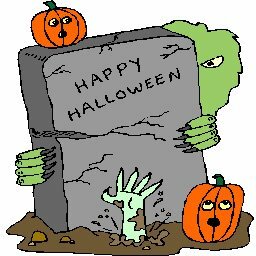 Avondale, East Lake, Eastwood, Inglenook, North Avondale, North Birmingham, Southside, Springville Road, and Titusville libraries will remember the day with book displays. "The September Project is a grassroots effort to get people together on September 11th to talk about issues that matter. September Project events take place in libraries, where all people are welcomed, and where the exchange of information and ideas flourish. The September Project encourages individual communities — neighbors — to make sense of the world together." For general information, photographs, first-person accounts, terrorism, and timelines concerning September 11, 2001 and beyond use the Web sites recommended by the Librarians' Internet Index . 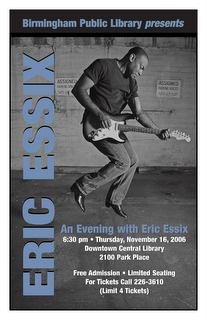 Books and videos are also available at BPL. September 8 is International Literacy Day, established to celebrate literacy and put a focus on improving literacy throughout the world. Approximately 860 million of the world’s adults, nearly two-thirds of whom are women, do not know how to read or write, according to the International Reading Association. In Birmingham, AL, an estimated 38% of adults are functionally illiterate. This means they are unable to read and write well enough to fill out a job application. 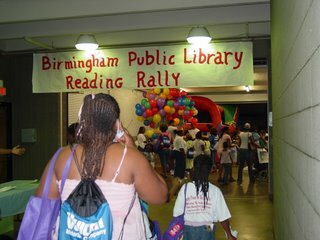 The Birmingham Public Library partners with the Literacy Council to provide the community with adult literacy services. Adults interested in learning to read, improving their reading skills, and learning English as a second language may contact the Literacy Council at 205-326-1925 or 1-888-448-7323. Tutors and students are encouraged to meet in the public library in order to utilize the many services and resources available. The high school dropout rate in Alabama is 37%, 10 points higher than the national rate of 27%. 75% of unemployed adults have reading or writing difficulties. 60% of America’s prison inmates are illiterate and 85% of all juvenile offenders have problems reading. 13% of all 17-year-olds are functionally illiterate. Among minority youth the figure is 44%. It is estimated that fifteen million adults holding jobs today are functionally illiterate. Almost 1 million adults in Alabama are not high school graduates. Youngsters whose parents are functionally illiterate are twice as likely as their peers to be functionally illiterate. The estimated cost of illiteracy to business and the taxpayer is $20 billion per year. Over half of Alabama’s prisoners never completed the eighth grade. Over 90% of Alabama’s prisoners do not have a high school education. In Birmingham 24.5% of Birmingham's citizens age 25 and older did not graduate from high school (2000 Census). To read more about literacy check out one of our books. Join Birmingham historian Jim Noles September 13 at noon in Central's Arrington Auditorium to learn about the ship called Birmingham. Known as one of the Second World War's unluckiest ships, the cruiser Birmingham fought gallantly in the Pacific while surviving a torpedo attack, a direct hit by a Japanese kamikaze plane in which 51 crew members were killed, and an explosion that took the lives of 237 men. 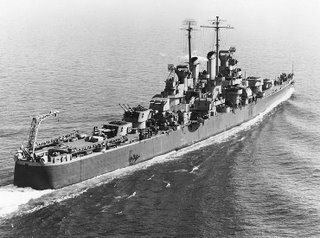 "A Ship Called Birmingham: The USS Birmingham in World War II" program is a part of BPL's Brown Bag Lunch Series. Mark your calendars for the 3rd Annual Great Garage Sale September 15th at the Central Library and come on down! We have something for everyone - baby gear, toys, kitchenware, decorative items, paintings, jewelry, electronics, gardening equipment, CDs, videos, music cassettes, stuffed animals, silent auction items and much more. Doors open at 9:00 a.m. and close at 4:00 p.m. in the Arrington Auditorium. 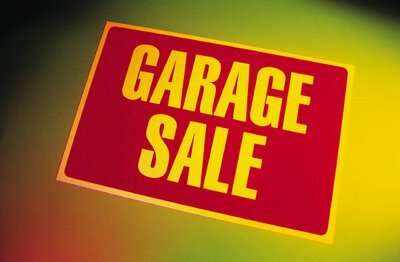 Popcorn, cookies and soft drinks will also be available for sale. All proceeds benefit our annual Staff Day. August 29th, 2005 Hurrican Katrina struck land and changed the Gulf Coast forever. Read about the disaster and view a comprehensive list of librarian reviewed web sites at Librarians' Index to the Internet. The library catalog will be unavailable August 30 while we upgrade our system. The databases will also be unavailable for use outside the library. BPL's librarians are participating in the national Jumpstart Read for the Record program today. The program hopes to bring the largest shared reading experience ever to the country by having librarians, educators, and parents read The Little Engine That Could to young children. 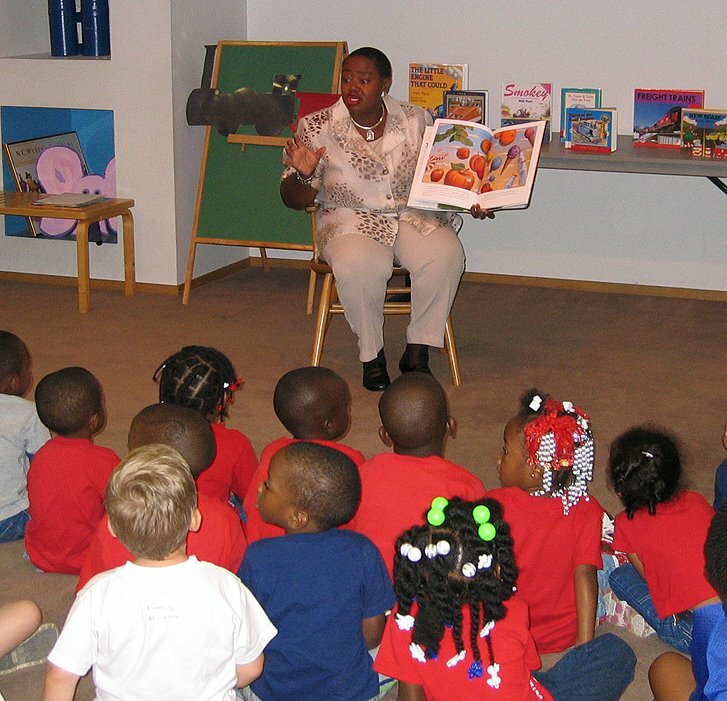 BPL Director Barbara Sirmans, as well as other librarians and staff, read to Birmingham's children this morning. 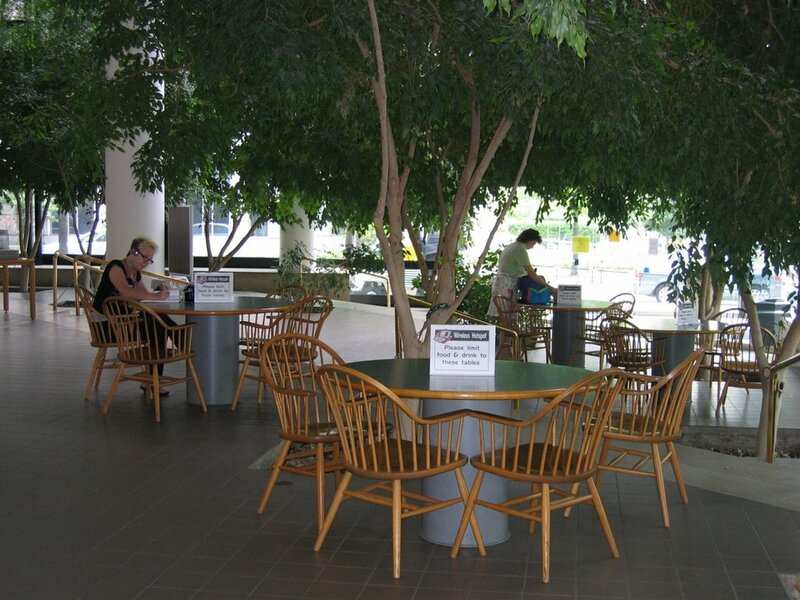 Bring your laptop, lunch and a beverage to Central's atrium and enjoy the cool atmosphere beneath the trees. View the work of Tom Barnes, Rob Cox and Uta-Marie Krapf in Central's 4th Floor Gallery. The artists' paintings will be on display until September 15. James R. Nelson, visual arts critic for The Birmingham News, reviewed the show at al.com. Thanks to everyone who came out to the Alabama State Fairgrounds and joined us for our annual Reading Rally. You made it a success and we hope to see you again next year! In case you weren't able to be there, look at some of the fun you missed. 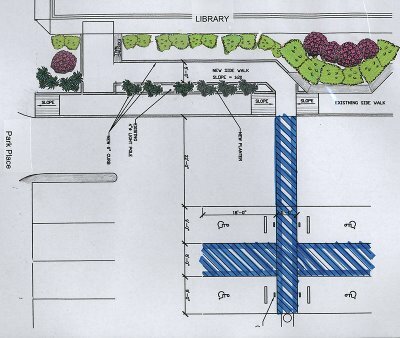 Construction will begin at the Birmingham Public Central Library on August 15th to replace the ramp and make the parking lot entrance ADA compliant.The project is expected to take several weeks. The main entrance at the corner of Park Place and 21st street north and the entrance to the Linn-Henley building at Linn Park will be open as usual. Check the library’s webpage for progress reports and photographs. What do Picasso, Jaguar, Pepsi, and Divorces Have in Common? They are all in a database! Wednesday's noon time Brown Bag program at Central highlights four of our more specialized databases covering topics as diverse as car repair, legal forms, business information, and art. 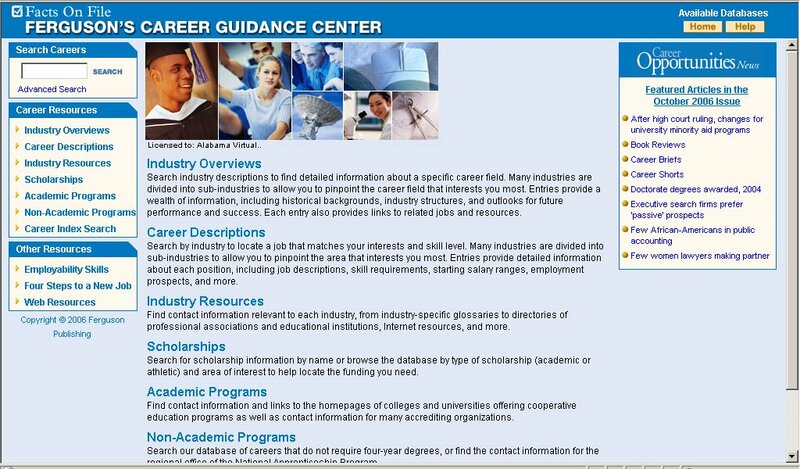 Come take a guided tour. Sunday night, in any town in Alabama: "Mom, I have a three-page report on the planet Mars due at 8:15 in the morning!" Homework! Who dreads it more - children, parents or teachers? Luckily, there is help for Alabama's students. Best of all, it's free. Last year, Alabama became one of the first states in the nation to offer free online homework help for students grades four through college intro courses. Funded by a federal grant through the Alabama Public Library Service, homeworkalabama.org allows a student to log onto the Internet and get a live online tutor to help with a homework problem in math, social studies, science and English. http://www.homeworkalabama.org/ is available from 3 p.m. to midnight seven days a week. Any Alabama citizen can use the service by typing in an Alabama zip code, grade level and subject. Federal and state dollars will fund the service for fiscal year 2007. 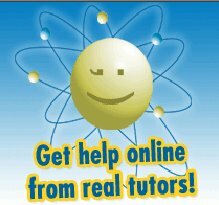 The homework service is staffed by trained tutors who have undergone a seven-year background check. Many of these tutors are retired teachers or graduate students and are here in the United States. Students, don't get your hopes up -- tutors won't do the work for you. They guide you into understanding and solving the problem by demonstrating with a chalkboard or with instant messaging techniques. Sessions are monitored and students supply feedback on their tutor. Waiting time for a tutor is usually less than five minutes. If you don't have a computer with Internet access at home, go to one of the more than 220 public libraries in the state. Almost all have free public access terminals where students can do their work. Alabama students logged some 56,000 sessions on homeworkalabama.org last year. Most were middle school students needing help with a math problem. The best part of homeworkalabama.org is it levels the playing field. Kids in rural farming communities have the same access to help as kids in large urban areas. Homeworkalabama.org has proved so successful that other states are looking at copying our service. Kansas will debut its homework site in September. Public libraries have even more free learning services. Your public library offers Learning Express Library (Learn-a-Test), a free practice test database that allows anyone to take any of 300 standardized tests, have them graded online and explained immediately. Tests offered include the GED, SAT, ACT, civil service exams, elementary reading and writing skills, and others. Tests vary in grade level and can be taken multiple times. If tests unnerve you, consider starting here with complete privacy in taking your practice test. All you need is your library card number to begin your free account with the database. Tests can be taken at any computer with Internet access -- at your home, school, office or library. High school students can practice college entrance exams and those of any age can prepare for the GED by taking the practice test. In 1999, Alabama was a national leader with its statewide virtual library service. 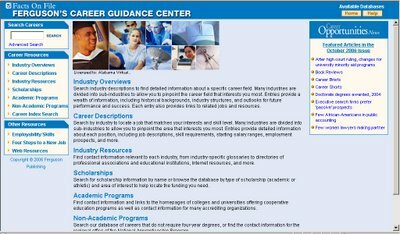 Through the cooperative efforts of five state agencies -- Alabama Public Library Service, Alabama Commission on Higher Education, Alabama Department of Postsecondary Education, Alabama Department of Education and the Alabama Supercomputer Authority -- the Alabama Virtual Library was born. This service continues to be a vital reference source for students. 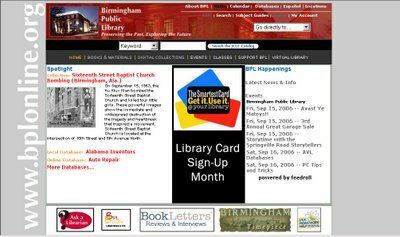 The Alabama Virtual Library card, free at your public library, allows you to access more than 90 databases that have magazine, journal and newspaper articles for research. It's not just for the students -- there are encyclopedias, medical-related databases, even an auto repair reference center on the site. This free AVL card, available at any public library or public school library, has something for everyone in your home. You can access the AVL from any computer with Internet access with your AVL card number. Today's public libraries are light years away from the hush-hush world overseen by a finger-pointing librarian of yesteryear. Since 1998, when the Bill and Melinda Gates Foundation chose Alabama to be the first state to receive a grant to provide public Internet access in libraries, we have not slowed down. Yes, we still offer books to check out, but we also offer films, magazines, newspapers, downloadable audio books, summer reading programs, book clubs, computer classes, books on tape for physically and visually impaired patrons, as well as our live online homework help, Learning Express free standardized practice tests and the Alabama Virtual Library. With the many services public libraries offer, we can tell you the Internet has not caused the demise of public libraries, as many feared. We are using the electronic world of the Internet as yet another means of providing information to you. School will begin soon. Homework will be assigned. Just remember if you need a little extra help, the public library is there for you -- at no charge. Most online resources are available 24 hours a day, seven days a week. Come visit us and get your library card. We'll be looking for you. Rebecca Mitchell is Alabama's state librarian.